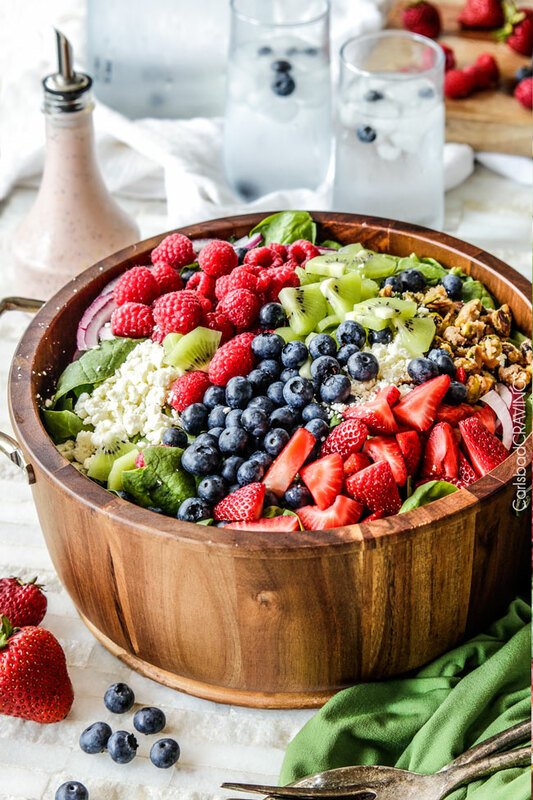 Berry Feta Salad with Creamy Strawberry Poppy Seed Dressing bursting with fresh berries and adorned with CANDIED pistachios and feta is so easy, delicious and beautiful for company, it is sure to become a new favorite! Add all of the Strawberry Poppy Seed Dressing Ingredients (EXCEPT the poppy seeds and sesame seeds) to your blender; blend until smooth. Add poppy seeds and sesame seeds and pulse until combined. For a tangier dressing, add more vinegar, for sweeter, add more sugar. Add additional milk to thin if desired. Store in the refrigerator while you prepare salad. Combine Spinach Salad ingredients in a large bowl and toss to combine. If serving entire salad immediately, drizzle with desired amount of dressing and toss to coat. If there might be leftovers, drizzle dressing on individual salad servings. Season with freshly ground salt and pepper to taste. *The Caramelized Nuts recipe is for 1 cup nuts. You can prepare 1 whole cup (because you will eat them!) or simply half all the ingredients. **You can swap out the strawberries for raspberries to make this a winter in season salad too!